After a brief, thankfully, lupus flare-up, I am pleased to bring you a wonderful picture book from the talented team of Ellen Fischer and Laura Wood. I think you will smile and enjoy a laugh with this wonderful follow-up to If an Armadillo Went to a Restaurant. “A platypus can’t play a violin,” young readers are bound to say. But what would a platypus learn in school? Kids will love learning what these animals—elephant, owl, zebra, frog, eel, bee, skunk, caterpillar, and platypus—would learn in school, while laughing at what it would not—could not—learn. Each “not learn” is something that a child will learn in school. For preschoolers, If an Elephant Went to School is a wonderful introduction into what they will encounter when kindergarten and first grade roll around. Older children will enjoy learning about these animals and poking fun at their own education. If an Elephant Went to School is a wonderful read a-loud book that encourages listener participation. With its winsome illustrations, If an Elephant Went to School is a funny, delightful read that children will want to go through on their own after a first reading. 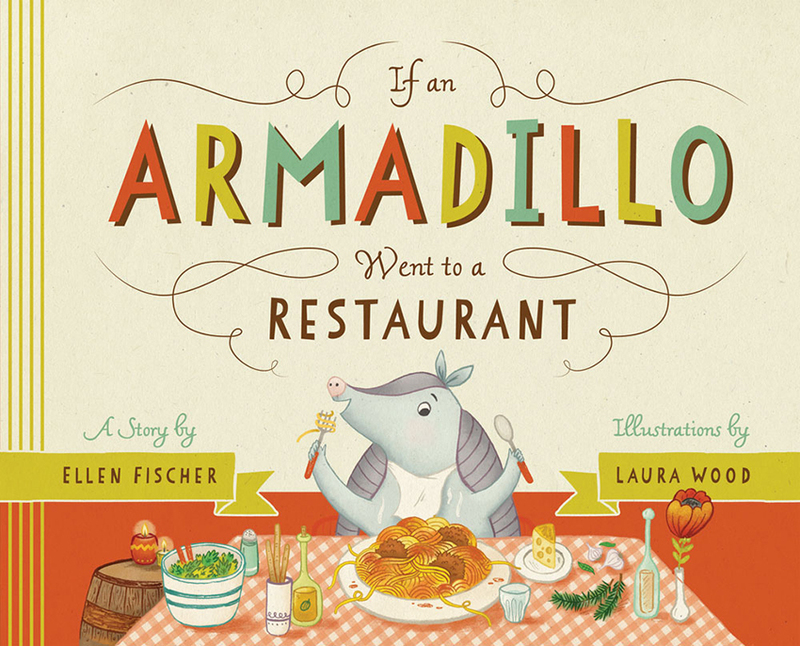 I think this charming follow up to If an Armadillo Went to a Restaurant, will have kids wanting to read—or listen to—If an Elephant Went to School several times. Reading this enjoyable, educational, and entirely humorous picture book should not press on any parent’s nerve while reading multiple times. If an Elephant Went to School—a truly fun giggle-book—should be a wild bullseye for booksellers. I have not had the privilege of reading If an Armadillo Went to a Restaurant (book 1 in the series), though I would love to do so. I am also hoping that this picture book series from Mighty Media Kids (formerly Scarletta Kids), will continue with its fun pokes at the wild kingdom, while teaching youngster about wildlife. For me, If an Elephant Went to School earns an A+! Wait, you say I only listed 9 animals, not 10?! You are correct. The tenth animal is YOU! IF AN ELEPHANT WENT TO SCHOOL. Text copyright © 2015 by Ellen Fischer. Illustrations copyright © 2015 by Laura Wood. Reproduced by permission of the publisher, Mighty Media Kids, an imprint of Mighty Media Press, Minneapolis, MN. Purchase If an Elephant Went to School at Amazon —Book Depository—iTunes Books—Mighty Media Kids. Learn more about If an Elephant Went to School HERE. Read my friend Eric’s excellent review of If An Elephant Went to School HERE. 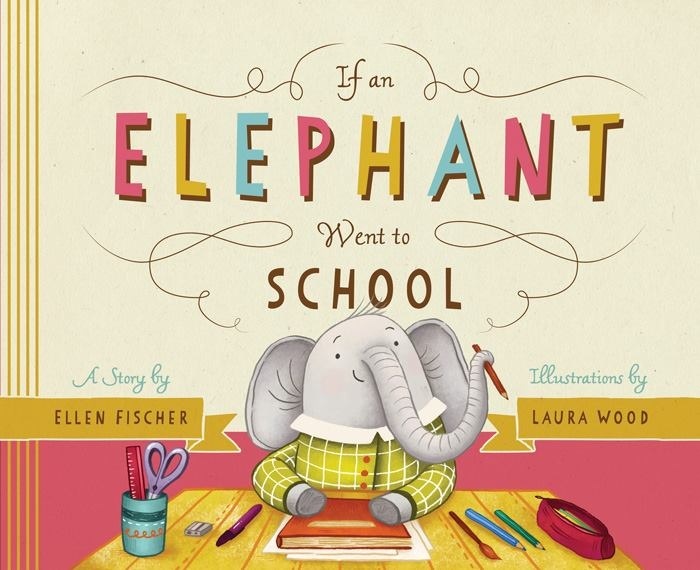 If you live near Greensboro, NC, plan to meet Ellen Fischer at the If An Elephant Went to School 08/15 Release Party. Mighty Media Kids is an imprint of Mighty Media Press. If an Armadillo Went to a Restaurant: Learn more HERE. Purchase HERE . View Illustration Samples HERE. My youngs will love this one!! It looks fantastic. We are reading Don’t Stick Sticks Up Your Nose! Don’t Stuff Stuff In Your ears! by Dr. Jerald Altman. It’s common sense so that’s good, but the kids think it’s hilarious! dontstickdontstuff.com is his site for the book, I recommend it! Right back at you! Your reviews are becoming more insightful and better written with each book. I hope there is a third book in this series. I love the animals in school. Have you read the first, about an armadillo in a restaurant? I bet that one is just as great. Pretty fun! Whenever I go to school I usually learn nothing! But I do knock over a few chairs and taste a few kids! I love school.